How did a secret society of artists in the 19th century turn into one of the most beloved interior design trends of the modern era? That story is the most surprising part of the exhibition (closing May 19) at Washington’s National Gallery of Art, Pre-Raphaelites: Victorian Art and Design, 1848–1900. Organized by the Tate (and originally titled Pre-Raphaelites: Victorian Avant-Garde), the show introduces us to the PR Brotherhood (founded 1848), whose oil paintings and writings looked to the Middle Ages, myths, and legends of ancient literature for the spirituality that they felt was missing from modern, rapidly industrializing life. Early collaboration by Rossetti and Morris, The Arming of a Knight chair, 1856 – 1857, painted pine, leather, and nails from the Delaware Art Museum,. 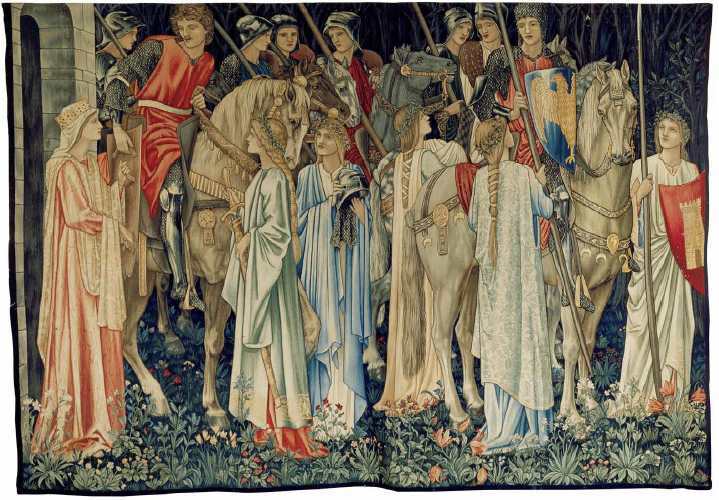 Dante Rosetti, William Holman Hunt, Edward Burne-Jones, William Morris, and others took inspiration from meticulous observation of nature, sensual textiles replicated in their paintings, and ethereal muses in medieval robes, which they often painted on location in leafy, natural settings. In 1859, Rosetti painted a cupboard as a wedding gift for Morris. It wasn’t long before these pals ran with the inspiration — constructing medieval-inspired furniture and decorating it with similar mystical medieval images and experimenting with mixed media (images + poetry) on tiles, tables, and other creations made by hand. For all the beautiful painting in the National Gallery’s show, the most startling room is the one that showcases the fact that the painters took it one step further by creating chairs, tapestries, tables, and textiles for forward-looking couples who wanted to live the 360-degree experience. In the 1860s, Morris & Co. was the go-to interior design shop for medieval-style avant-garde furnishings. They singlehandedly drove the stained-glass revival in Victorian architecture. In 1873, Morris & Co. went international, selling wallpaper in Boston. Soon, American retailers in most major cities were carrying the hand-blocked or woven wall coverings and textiles. 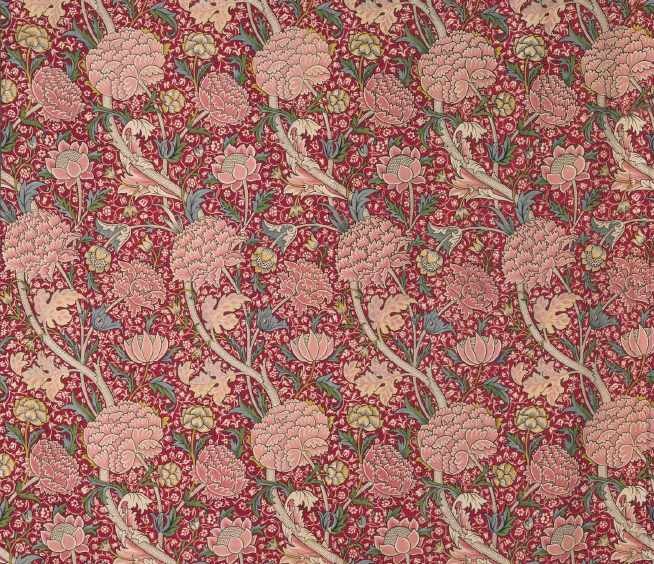 Ever the advocate of the handmade, Morris was passionate about the relationship of decorative arts to the modernist movement. During Oscar Wilde’s US speaking tour in 1882, his lectures about Morris, the Pre-Raphaelites, and the nobility of hand-crafted work spread the trend in hand-crafted interior design in America. Today, just about every museum shop carries William Morris-inspired something-or-others. Here’s the Tate’s video about the 17th century carved oak bed that Morris himself used in the 1890s. It’s all about the hand-made approach to the bedding textiles – a modern-medieval collaboration between his designer daughter, Mary, and wife, Jane. Hats off to the Tate and National Gallery for presenting avant-garde design in a new light. Check out the rest of the Tate’s PR videos, including the one with Karen Elson on the topic of model as muse, then and now. This entry was posted in Art, Fashion, History, Museums, Nature and tagged arts, culture, design, fashion, history, marketing, museums, nature, painting, style, textiles by mssusanb. Bookmark the permalink. I love these and Julia Margaret Cameron is a great favorite. I would have liked to sit for her!! !